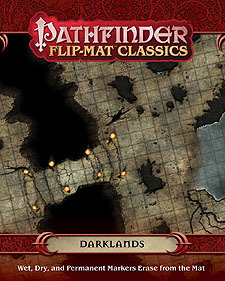 Crawl into the depths of the earth with Flip-Mat Classics: Darklands! Whether the adventurers are just checking out a cave, or fighting their way through a subterranean tunnel system, this Flip-Mat provides a ready-to-use combat map for a variety of encounters. Don't forget to bring plenty of light and watch out for collapses when using Flip-Mat Classics: Darklands!